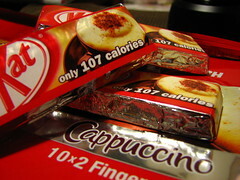 Coffee-flavoured KitKat – always a good idea. Available in packs of 10 – another great plan. Very glad that I had the foresight to buy 2 ten-packs. This will give the chance to savour them properly and review them fully. Again and again. 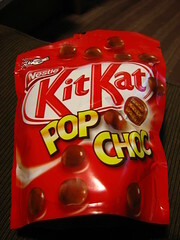 Like KitKat Little, but in a much bigger pack! Everyone’s a winner. I wish I could find the photo of this, the most terrifying KitKat on the market. 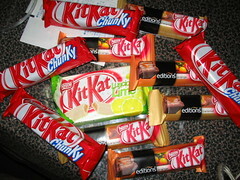 With a design apparently based on a police riot control baton, a pivotal moment in KitKat research – proof that there is such a thing as too much KitKat. Tasty, but unnecessary. A bit smaller than a regular Chunky, so will leave you wanting, needing more. Very special indeed. First is the plain chocolate, which was just OK. Just didn’t seem to have enough flavour. 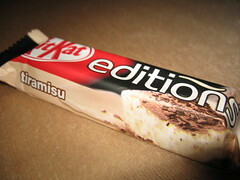 Next is the MintKat, which would have got five stars if only it had been plain chocolate instead of milk. 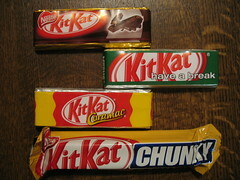 Then the now famous KitKat Caramac – the nostalgic marriage of what were Rowntree’s KitKat and Mackintosh’s Caramac. Faultless. Peerless. Tons in my fridge. And finally the Chunky Peanut Butter. Another surprise. 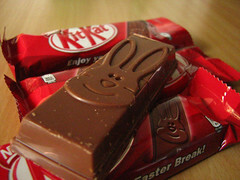 Wouldn’t choose it over other KitKats but extremely tasty nonetheless. We need to break this down a bit. First, the Editions – a caramel and a Seville Orange – both faultless. …the abomination labelled ‘Luscious Lime’. The single star is because I didn’t envisage needing a ‘no stars’ rating. Tasted like it would probably keep your toilet free of germs for weeks.